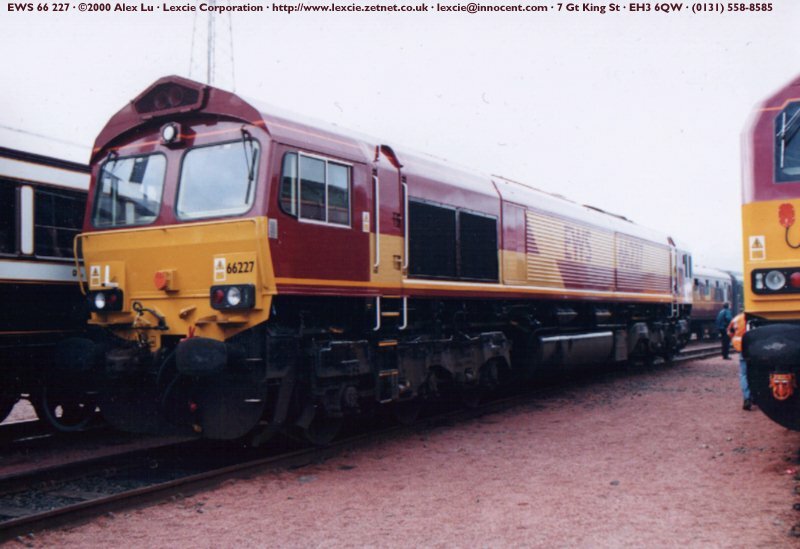 EWS’s 66 227 seen at the West Coast Traincare Polamdie Depot Open Day on September 16, 2000. 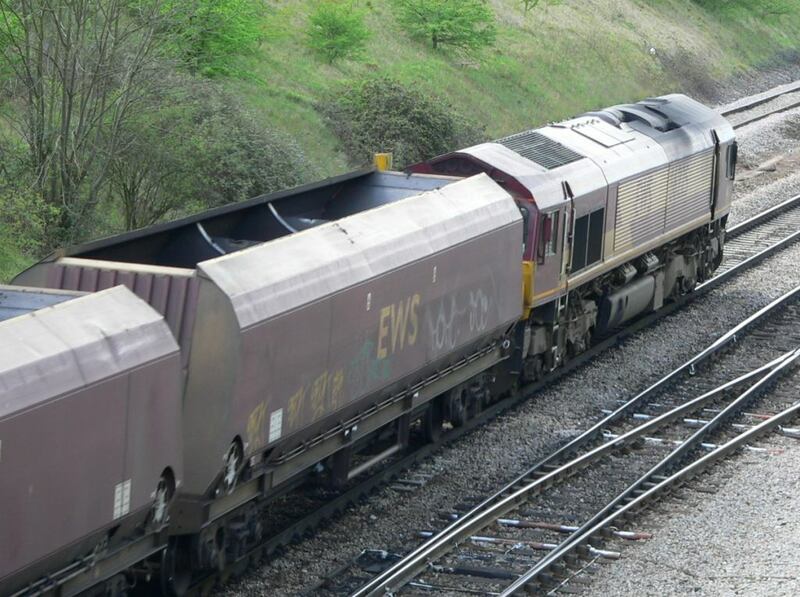 EWS Class 66 - 66231 approaches Hatfield & Stainforth in South Yorkshire with an unidentified M.G.R working formed of HTA Bogie Hopper's on Mon 28th May 2007 at 12:05. EWS 66232 at Barnetby on 20/09/05. 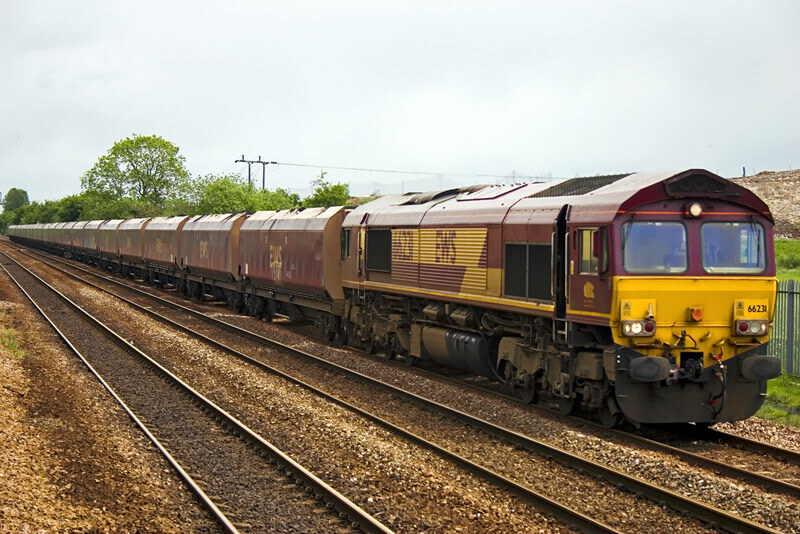 EWS Class 66 diesel locomotive 66324 approaches the Godfrey Road Lomotive Stabling Yard adjacent to Newport station in South Wales after finishing its duties for the day. 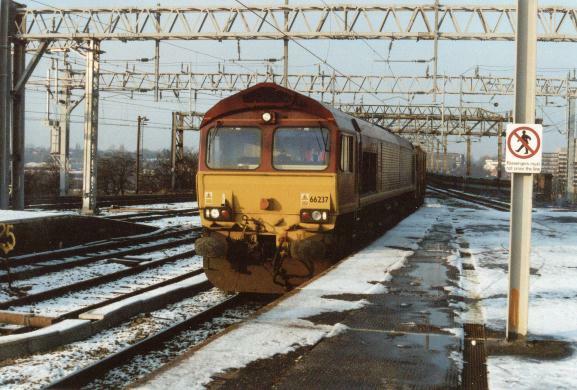 66237 approaches Stockport on a binliner train, on a snowy friday in January 2002. 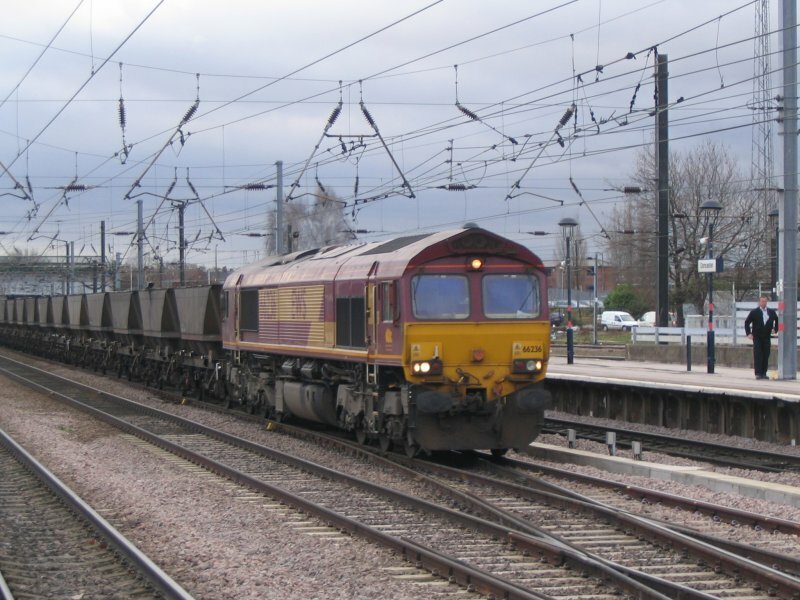 EWS Class 66 - 66242 passes through Newcraighall station at the head of a rake of HAA 'Coal Hoppers' on Tue 6th Mar 2007 at 11:25. 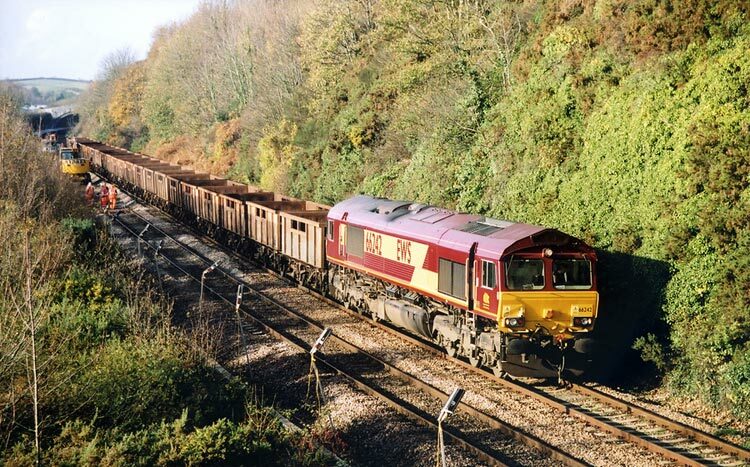 66242 working inside an engineering possesion at Wearde Quay, Cornwall on November 15, 2003. 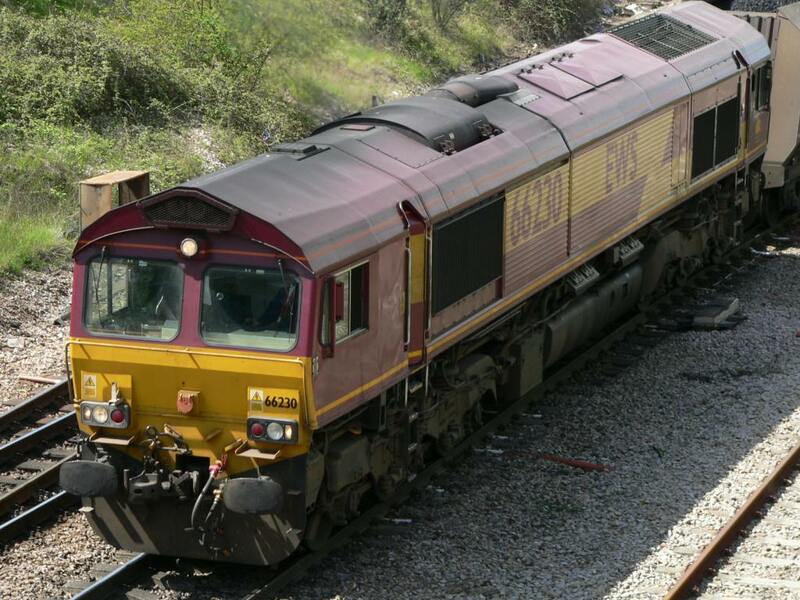 EWS 66249 near Barnetby on 20/09/05. 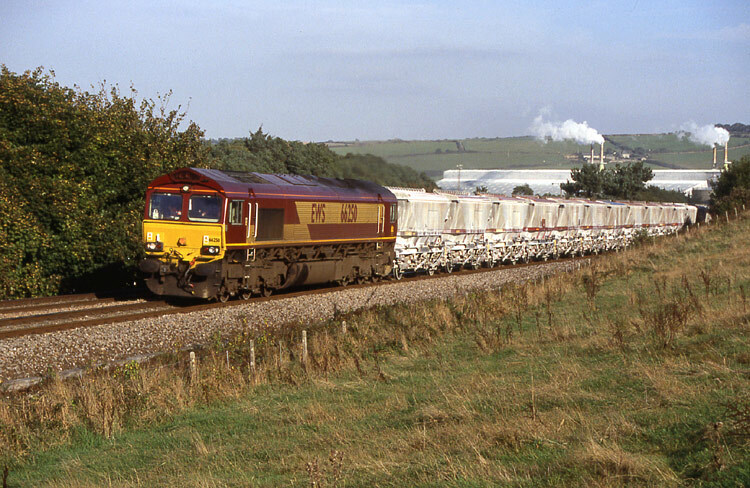 66250 against the backdrop of Par Harbour in Cornwall with a CDA China Clay train on October 15, 2003. 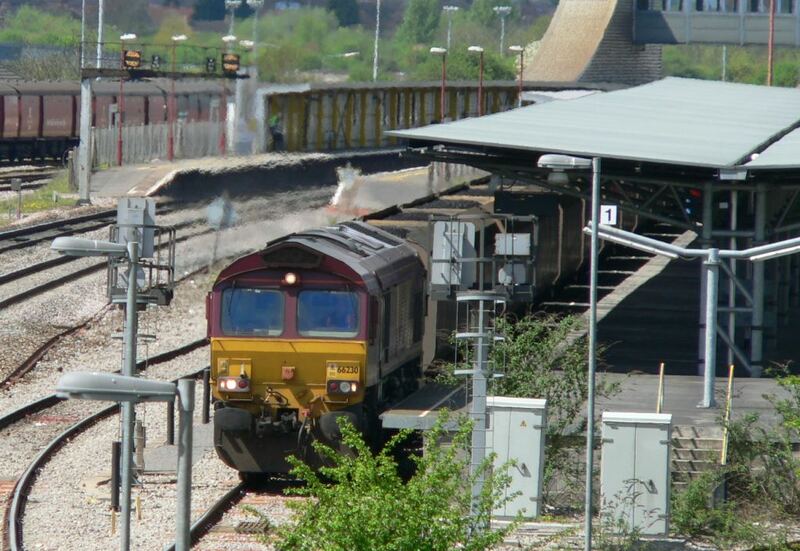 Three different diesels at the eastern end of Bristol Parkway station. In the centre of the image First Great Western Class 43 HST powercar 43145 brings up the rear of a delayed westbound express service to Swansea as a Class 220 Virgin Voyager DEMU departs with a northbound Cross Country service - note the extreme difference in lengths of these two intercity express services! 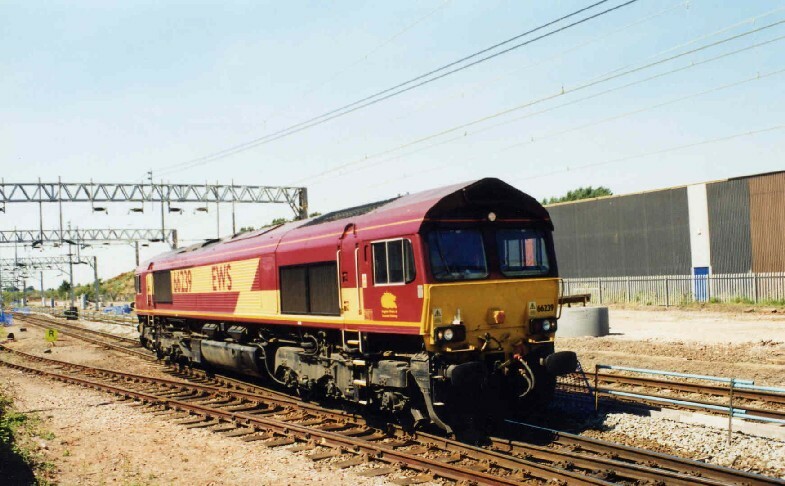 On the right of the image EWS Class 66 diesel locomotive 66230 waits by the now disused Royal Mail platform with an eastbound freight service conveying coal, most probably from the South Wales coal field to Didcot Power Station. 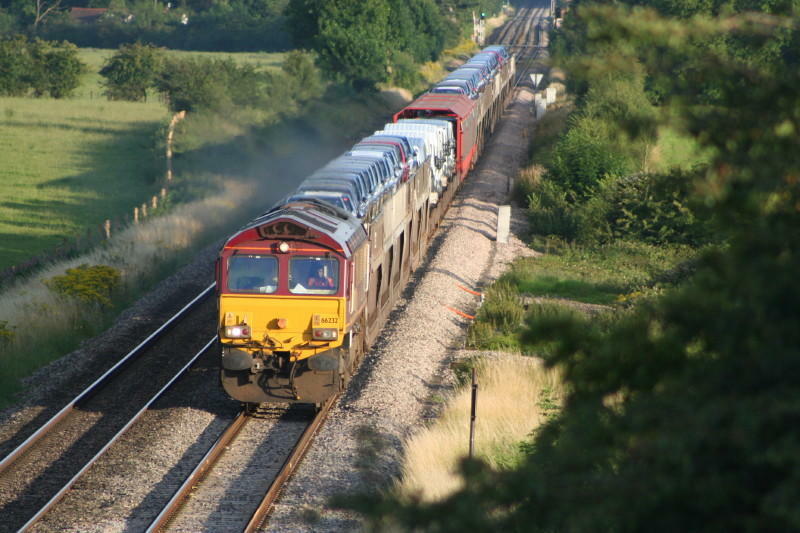 In the background on the left is a long line of storred Royal Mail travelling post office vans awaiting their fate in Stoke Gifford rail yard on the south side of the station. Photo by Chris McKenna 03/05/2006. 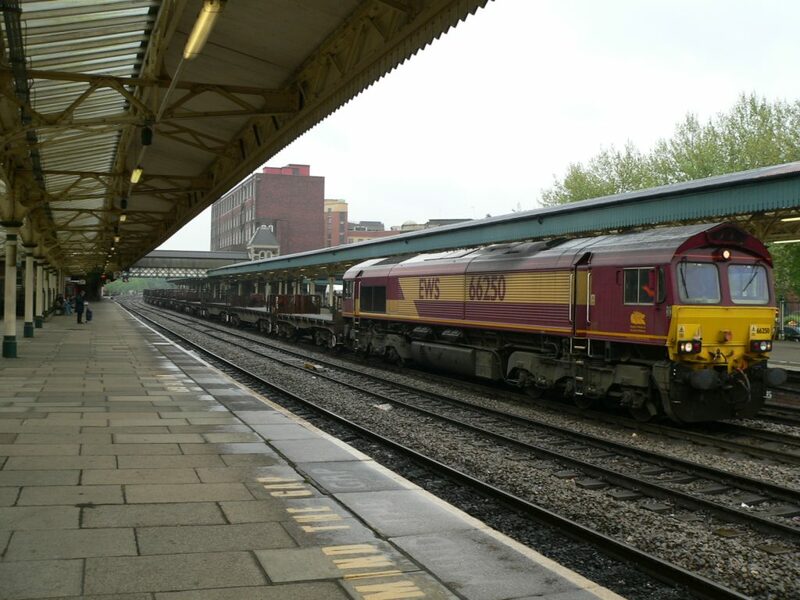 EWS Class 66 diesel locomotive 66237 hauls an engineers train northbound through Bristol Temple Meads station. Photo by Chris McKenna 15/06/2006. 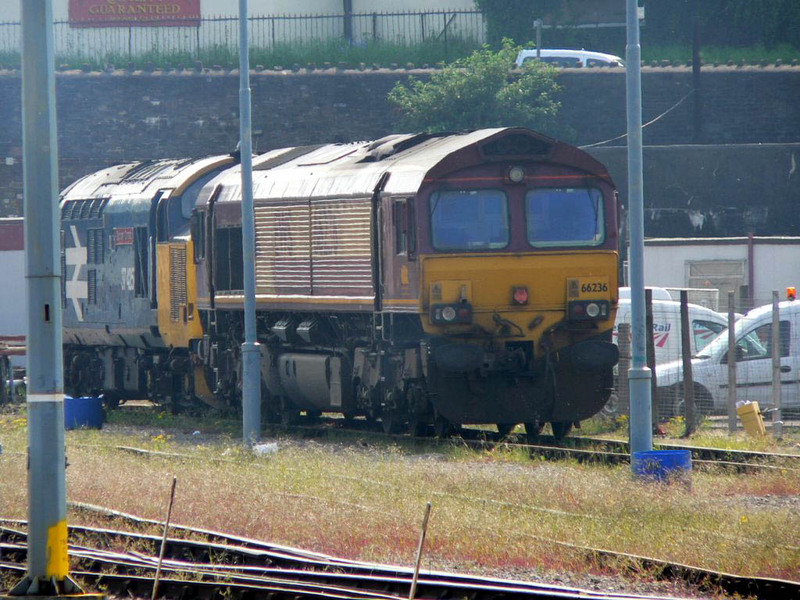 EWS diesel locomotives in the sidings at the western end of Newport (South Wales) railway station. 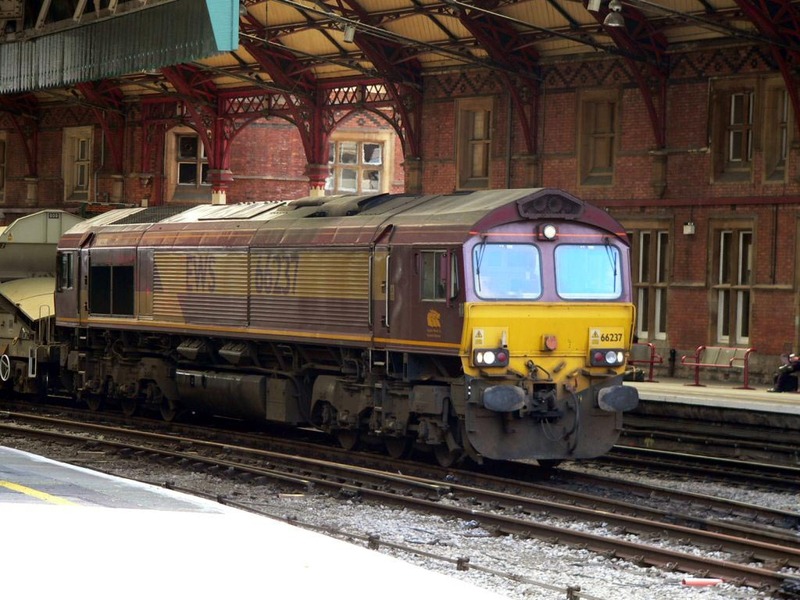 In the foreground is Class 66 66236 in EWS's standard maroon and yellow livery; behind it is Class 37 37425 Y Draig Goch in BR Large Logo livery. 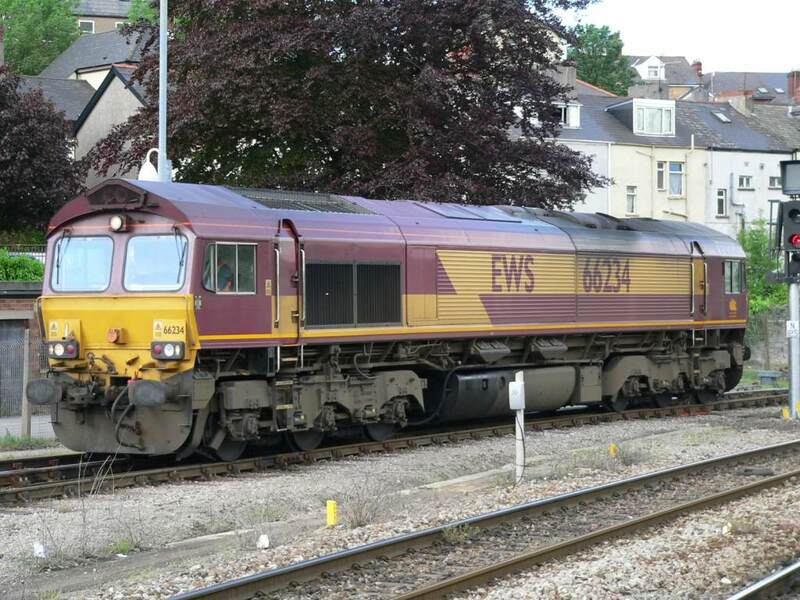 EWS Class 66 diesel locomotive 66250 - the 250th and final Class 66 constructed for EWS - hauls a westbound train of empty flatbed wagons through Newport station in South Wales. 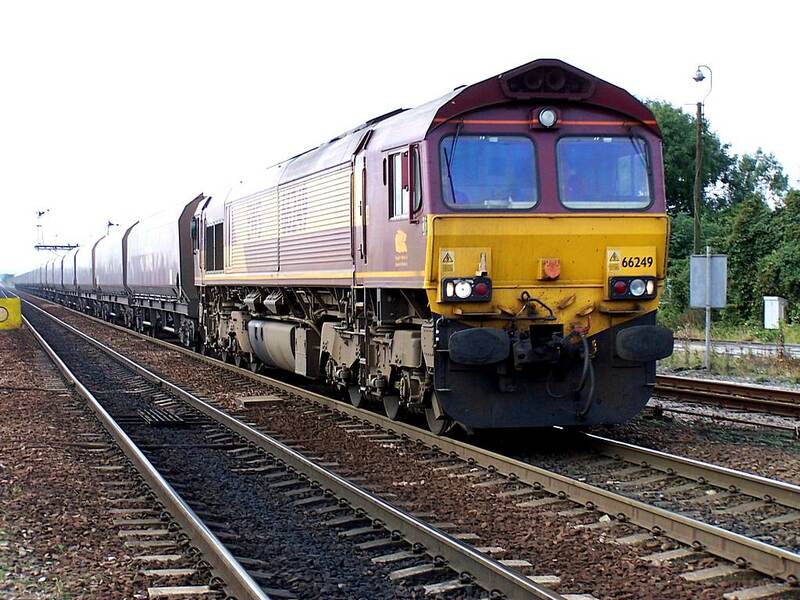 EWS Class 66 locomotive 66230 waits for the signal to clear at the eastern end of the goods loop past Bristol Parkway station. 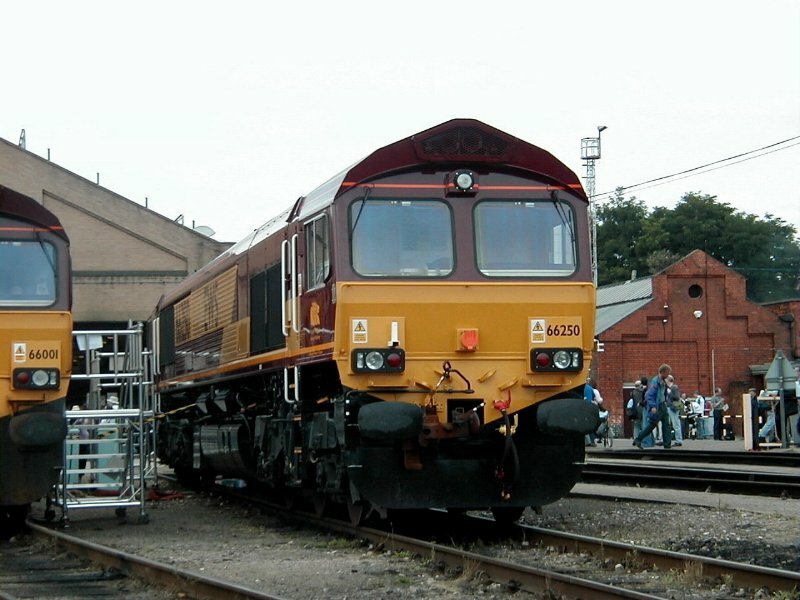 The platform to the right of the train was built as part of the new Royal Mail depot shortly before the demise of mail by rail, and like the rest of the depot is now disused. The passenger platforms are visible in the background through the haze of the loco's exhaust. 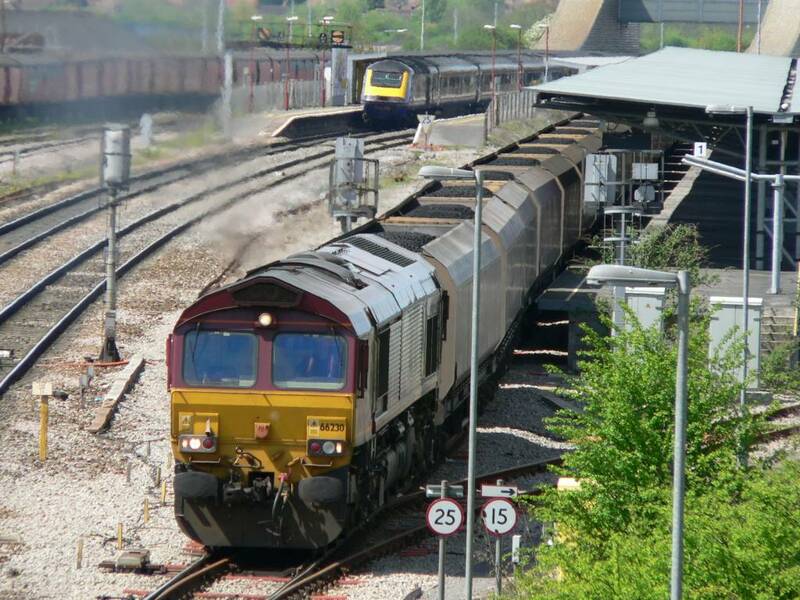 EWS Class 66 locomotive 66230 heads east from the goods loop past Bristol Parkway station with a coal train, presumably for Didcot Power Station. 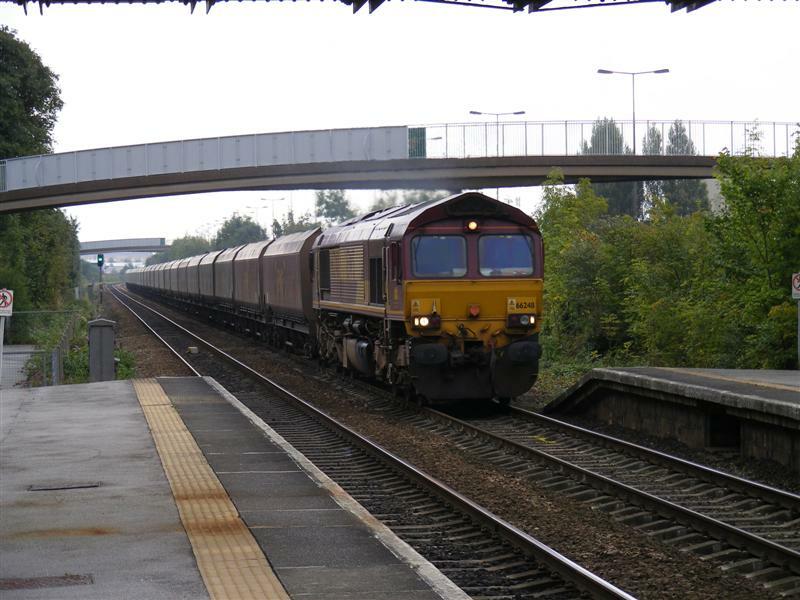 The platform to the right of the train was built as part of the new Royal Mail depot shortly before the demise of mail by rail, and like the rest of the depot is now disused. In the background a First Great Western HST waits at the westbound platform with an express service to South Wales. 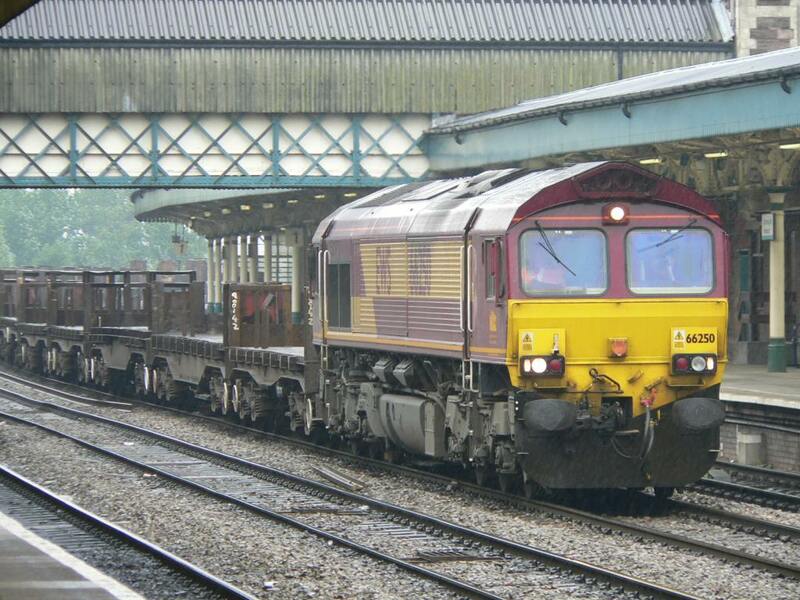 EWS Class 66 locomotive 66230 heads east with a coal train, presumably for Didcot Power Station. 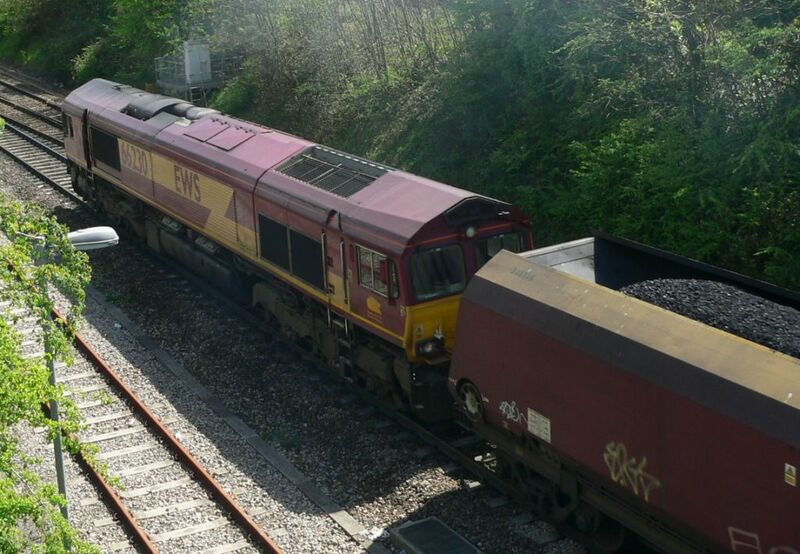 This photograph was taken from a bridge over the railway about a third of a mile east of Bristol Parkway. 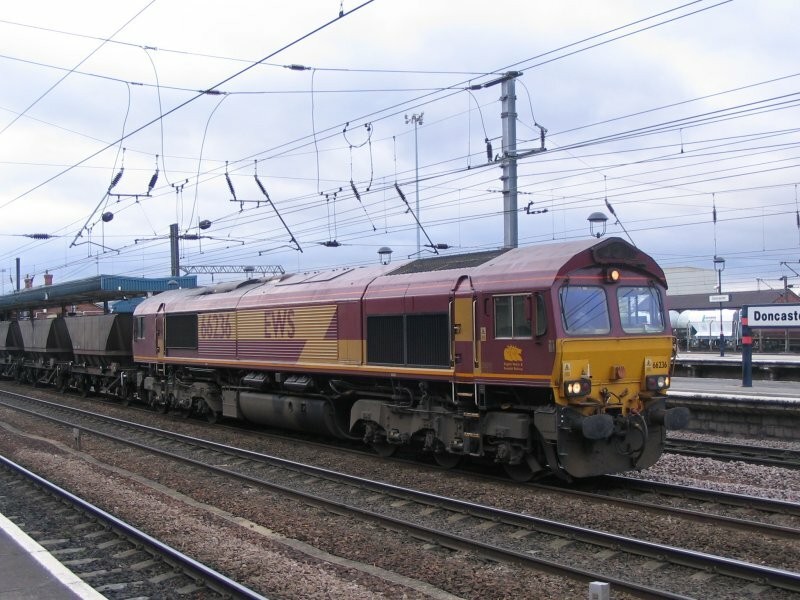 EWS Class 66 locomotive 66230 heads east with a coal train, presumably for Didcot Power Station. 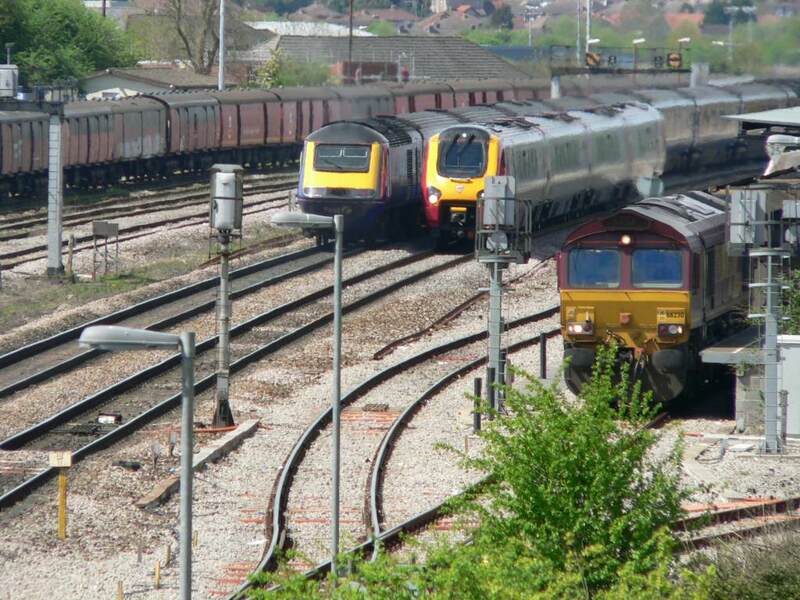 This photograph was taken looking east from a bridge over the railway about a third of a mile east of Bristol Parkway. 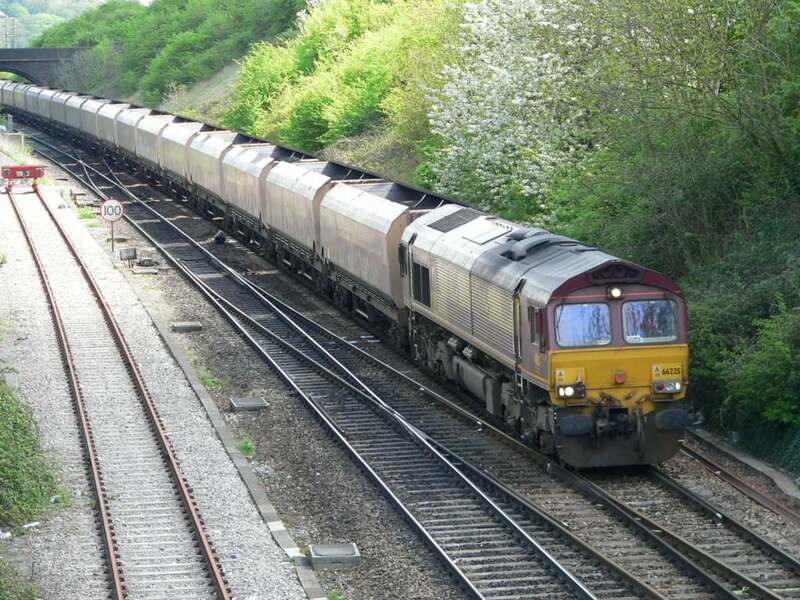 EWS Class 66 diesel locomotive 66225 hauls a rake of empty coal wagons eastbound along the South Wales Main Line, photographed looking east from a bridge about a third of a mile east of Bristol Parkway railway station. 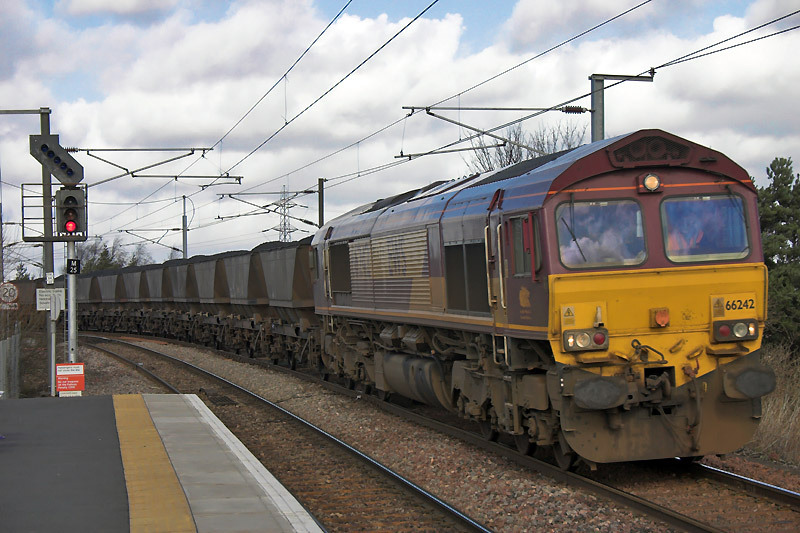 EWS Class 66 diesel locomotive 66225 hauls a rake of empty coal wagons eastbound along the South Wales Main Line, photographed looking west from a bridge about a third of a mile east of Bristol Parkway railway station. 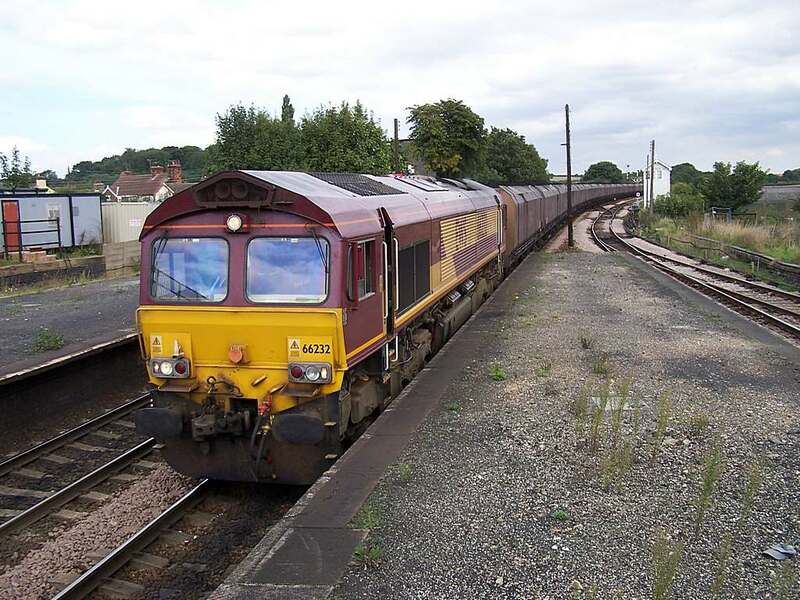 EWS 66239 runs light engine through Nuneaton on the 12th July 2003.